He makes all the difference. “I'll never do it again,” we say — and then we do it. In a world full of challenges, temptations, and even addictions, it is easy to lose hope for ourselves and those we love. During times of discouragement, we must remember that the purpose of the Atonement of Jesus Christ is not just to cleanse and console, but also to transform — and that takes time. Christ is not waiting at the finish line once we have done —all we can do.” He is with us every step of the way, and His Atonement will be available as long as the perfecting process takes — continually. 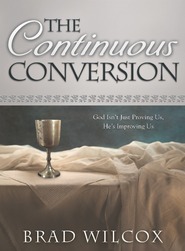 This book offers valuable insights about God, Christ, and our relationship with them. Each chapter contains clear examples that will uplift and motivate. Profound doctrine is made accessible and difficult concepts are presented in such simple ways that over and over the reader will say, “I've never thought of it like that before.” That kind of change of belief will help bring about a change of behavior. Most members of the Church acknowledge that perfection is a long-term process, but overlook the continuous nature of Christ's Atonement that makes that process possible. Peace is found not by giving up or erasing the need to change, but by turning to the One who makes change possible and realizing that we get lots of chances to start again. So, if at first you don't succeed either, don't find excuses. Find the Savior and the blessings of His continuous Atonement. I loved all of the book! I highlighted most it. There is so much meat in there that there's loads to chew on and ponder over!! We all know we've messed up. Many books on the atonement will leave us filled with guilt, which can be a great motivator for change, but this book motivated me by reminding me WHY we need the Atonement, and WHY the atonement works. It is continuous, and we can be made clean through its power. A book that changed my life. This book shows us very well how the atonement cures not only sin, but also the feelings we feel each day. Wilcox added many real life stories that help portray each case the atonement is there for. “The Continuous Atonement” proves to each of us that Jesus is the Christ and that only by, and through him can all men be saved. Without him no man can enter into the kingdom of God, and how the suffering of Jesus Christ was more than what we think. Never has any book made me feel so close to the savior except for the scriptures. By the end I understood a whole lot more of how powerful the atonement is and why we had to have one. Wilcox made this book easy to understand the principles of the great sacrifices and did so with great power. This is a tremendous book from Brad Wilcox. Wilcox has an entertaining command of the english langauge that makes reading this books easy and insightful. Wilcox has helped completely changed my outlook on the Atonment, and other doctrines of the church such as the nature of God and the Fall. I have reccomneded this book to almost everyone I know who is struggling with their personal worth and needs a spiritual jumpstart. definitely a book worth buying. This book arrived in my life at exactly the right time. I have not yet finished it ... but am so excited to read it every night (with my husband) that I actually rush through my nighttime activities. I have found great insight, comfort and motivation (to improve) and experience numerous 'Ah-ha!' moments. I just loved this book. It is a book that I know I will read over again and again. It is not only for the discouraged, but for everyone. I tell everyone I know about this wonderfully, clear, touching, and enlightening book. Get it, read it and don't wait! Perfect for Christmas or any occasion. For many years I wondered that perfection was so impossible, a distant goal that was unreachable...not that I would ever be perfect in this life anyway, but we are so often impressed upon to go the distance and become as perfect as possible. Daily failure finally erodes our resolve and makes the goal so big, that any effort seems futile. This book explains how our efforts amount to something, and count for something, and how we can improve our relationship with Christ..knowing Him as a real contributor to our success and final perfection. Amazing, timely and essential..thank you. Finally the atonement in words I can understand. This book gives great insight into how the atonement works on a personal level. I am selective in the books I buy because I don't want them to just sit on a shelf. This is one that will be read over and over. I can't wait for "The Continuous Disciple," Brad! Recommend this one to all you friends! I loved this book! The study of the Atonement has become an obsession with me as I have had to call upon it again and again to get through life's difficult challenges. When I find a book that gives me further insight to this incredible gift I have to share it with all my friends. Brother Wilcox brings out things I hadn't thought of before making the Atonement even more meaningful to me (which hardly seems possible). Thank you, Brother Wilcox, for sharing your wisdom and insight! This has opened my eyes a little differently, to appreciate the Atonement, and its continual application to us all! At a time when this earthly journey seems to be in jeopardy, when there's little help for feeling hope and despair seems deeper than ever, The Continuous Atonement brought me a great light to understanding this constant principle. Brad's personal stories of his missionaries, his family and his own teaching experiences enriched his explanation of the atonement in a way that I could truly wrap my heart around and strengthen my testimony. I am better for reading this book and am enpowered each day reflecting on his words of the gift of the atonement. A must read for all. Thank you, Brad! Our family has read and listened to Pres. Wilcox for many many years. This new book is amazing and will bring new concepts and comfort as he teaches you how to let the Atonement work in our lives. We love you Pres. Wilcox. I just finished the Continuous Atonement and I feel that I have a greater appreciation for the depth and breadth of the Savior's influence in my life. Brad is a master story-teller as he provides personal experiences, analogies, and perspectives which young and old alike will truly enjoy. The book makes the Atonement accessible for everyone. It is a great resource of quotes, scriptures, and inspiration that I will go back to many times. I know the rest of my family will benefit from reading how the Atonement can influence and impact their lives eternally. I read this book directly after Kimball's "Miracle of Forgiveness." The juxtaposition was wonderful. While Kimball's words are detailed and one might say harsh (though in the best of ways). Wilcox's "The Continuous Atonement" is embracing with love. It presents repentance as something beautifully simple and simply beautiful. We are all in need of help and this book tells of where to find it. This book will change your life in the simplest, yet most wonderful of ways. I loved this book. I went to Women's conference and attended Brad's class. After leaving the presentation I knew I was meant to be in it. I felt the spirit so strong in his class and bought this book a week later. I loved reading the book as it is one of those life changing books that bring us closer to our Heavenly Father and Christ. This book inspires us to become more like Christ, but give us hope and faith ( that through the atonement we can. There is a beautiful feeling of motivation to become better, not guilt. I loved this book so much that I have already given 2 away to friends. If you haven't yet...READ this book! This book is for those LDS members who are doing his or her best to live the Lord's commandments on a day to day basis. This book is not a "feel-good" book, but explains the true meaning of Christ's most infinite and 'Continous' Atonement, and thus explaining that we as members need to remember that ANY effort we give to bettering ourselves is ACCEPTABLE to the Lord. HALLELUYAH! I loved reading this book. Brad Wilcox's insights and stories really helped me to capture a greater understanding of the Atonement of Christ. How blessed we are to have the Atonement, and all that it contains. This is one of those books that become the classics that don your family bookshelf. Books that will be read and re-read again and again. Reading this book has been like entering a new sphere of understanding. I highly recommend this book. I've used some of its insights on the Atonement in a discourse as a High Councilor, and the Spirit was so strong! Buy it and read it more than once. You will appreciate more fully what the Savior did and is willing to do for us. This is a must read for anyone wanting to gain a deeper understanding and apprieciation for the atonement of jesus christ. I loved the book and felt the spirit enlighten my mind and build my testimony. I am so grateful i choose to read this amazing book.